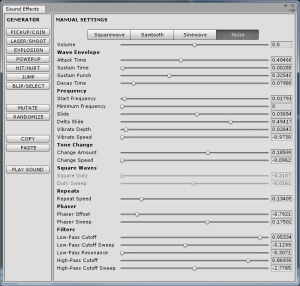 It’s been a little more than one year since I introduced usfxr, a Unity/C# version of the well-known real-time procedural game audio generator sfxr. 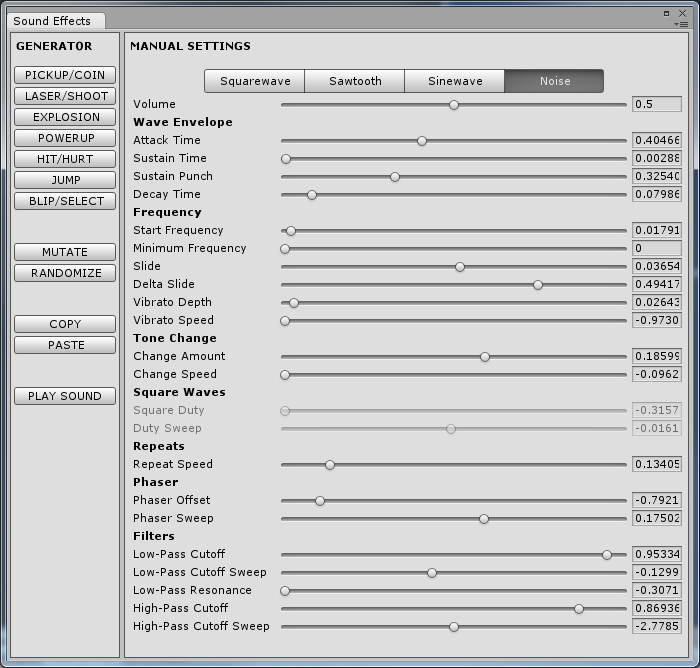 What it has been lacking for quite some time was the ability to generate sound effects right inside the Unity interface; developers were forced to visit an online source like as3sfxr to generate their audio parameters (as a string), and only then use usfxr to play the audio in Unity games. It also plays audio automatically every time one of the parameters is changed, so it’s easy to mess around with it until you get the sound effect you want. The generator window also works whether you’re in play mode or not, so it should make it easier to create sounds on-the-go. The new version of usfxr can be found on GitHub.